Chocolate bourbon caramels, English toffee, praline pecans and more arrive in a festive and welcoming five-box tower, all dressed up with gold satin ribbon. Dark Chocolate Bourbon Caramels, Coconut Praline Pecans. Maple Cashews, Almond Roca, Harvey's Toffee Popcorn. Milk Chocolate Cherries, Triple Chocolate Toffee and more. Nuts and Chocolate Wishes Tower is a hand delivered gift. These gifts are delivered by one of our local design centers located throughout the United States and Canada. Same day delivery is available for most gifts when ordered before the cutoff time. 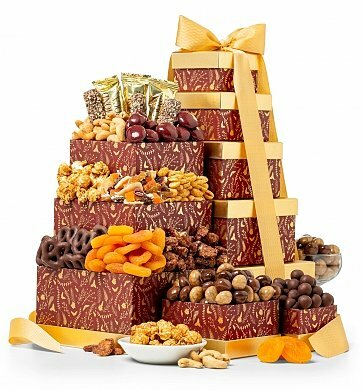 The cutoff time for Nuts and Chocolate Wishes Tower is 1 PM in the recipient's time zone. Gourmet nuts and luxury chocolates, plus popcorn and more. Five exclusively designed gift boxes stacked in a tower with hand-tied ribbon.